It’s a pleasure and a privilege today to introduce y’all to the music of Jenn Thornton and her debut EP – Roll With It. Miss Thornton’s sound has the pure, crisp feel of old time country but with a modern twist. A native of Oxford, Ga. (seriously it’s on the map), Jenn was raised on classic country and Southern gospel. Not only did she inherit her grandfather’s guitar but she also inherited his musical talents. After graduating from the University of Georgia, her first gig in the music business was singing in a bluegrass band that was touring out west. Although she enjoyed the tour, an irresistible opportunity was presented to move back to Nashville and pursue her solo career. Jenn jumped head first into the writing scene and began her growth as an artist in country music mecca. Pretty Southern caught up with Jenn to discuss her first EP and what it’s going to take to make her dreams come true. When did you discover your passion for singing? I was born with the natural instinct to entertain. From the time I was able to walk and dance, I would jump around on the coffee table, holding the remote as a microphone, singing along to Elvis, Patsy Cline, and the Judds. The desire to sing came along very early too. I grew up in a family full of musical talent. I can’t remember life with out it. My grandfather would always get us together after big family dinners and he and my uncles would play guitars, as me and my family sang old gospel music and of course Hank Williams Jr., Merle Haggard, and other traditional country artists. I come from a family with 12 female cousins. It was practically a family choir! Singing has always been more than just a talent for me. It is a way to connect with myself and others, which is where the true passion lies. What have you been up to since graduating from UGA? After graduating with an Agricultural and Applied Economics degree (random I know), I have pretty much gone the complete opposite of my degree. I am very thankful for it and my time well spent at UGA – Go Dawgs! – but my creative side has since taken over. I moved to Jackson Hole, Wy., and worked on a dude ranch as a wrangler. That’s where the opportunity to preform and reconnect with singing began. I played in a popular, local bluegrass band for a while. I decided that I wanted to make singing, songwriting and sharing my music my career. So, I moved to Nashville. What inspired you to pursue your passion for music? My true inspiration for what I do comes from the undeniable capability that a song, lyrics, and instruments combined can change one person’s day, month, year, or even life. The power of a song can reach the saddest and the happiest; when no one else can listen or understand, music can. That’s why I decided not only to sing, but also to write music. I love people and want to share the talents I’ve been given as much as I can. What was the album creation and development process like? Wow! It was incredible! I had never done any studio work prior to this EP. My producer, Nick Baumhardt, was so awesome. I was there for the development of everything. I got the opportunity to work with some incredibly talented musicians. The entire process was very educational for me. I learned a lot about how to listen for certain things and just how important sound levels and placements are in a track. Developing the guitar licks was probably my favorite part because it really made my songs come to life. It was such a rewarding time as a songwriter and a singer! What’s distinctively Southern about your sound? Honestly, keeping it country is important to me. I have huge influences in my music from traditional country, Southern rock, gospel, and even some blues. I intentionally wanted to have banjo, fiddle and pedal steel in my songs. All of those instruments are true testaments to country music and provide sound from the past and the present. Oh, and there’s the undeniable twang in my voice that keeps it Southern. My primary focus of this year is to tour and continue to grow my fan base. I will be writing and promoting myself as an artist and a songwriter. I hope to be writing for not only myself but for other radio artists in the near future. And I am always open to record labels and radio! This next year holds some exciting times. I can’t wait to see what’s in store. 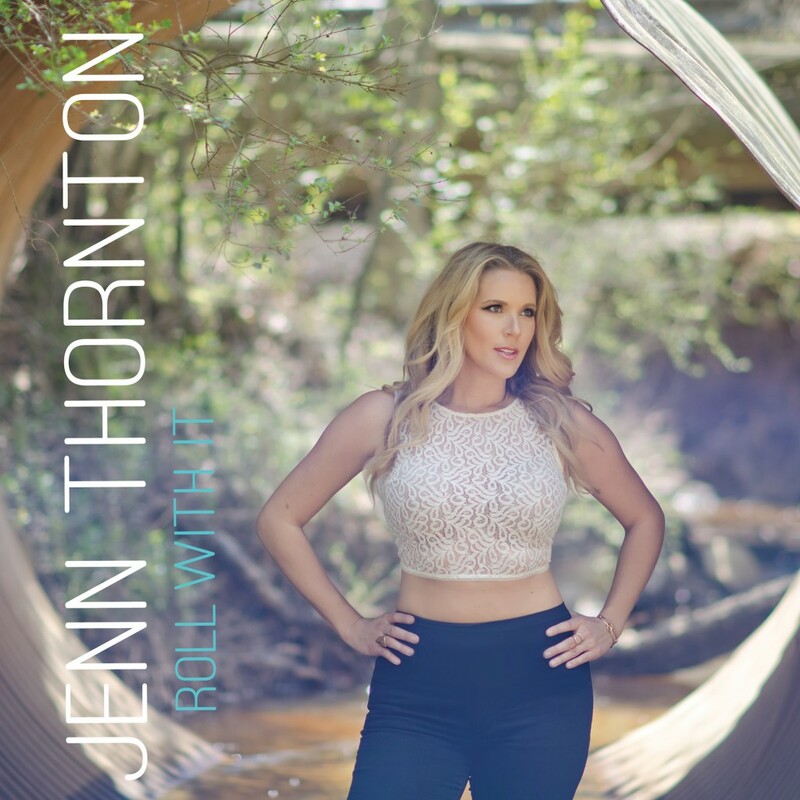 Jenn’s first EP – Roll With It – is available to download on iTunes for only $5.94. Be sure to Like Jenn Thornton Music on Facebook and we’ll keep y’all posted on her upcoming tour dates.